This is any exercise that makes you move your large muscles rhythmically. It moves you fairly continuously and makes you sweat and breathe deeply. Aerobic exercises help improve heart and lung fitness. They also improve stamina and reduce fat. Walking, jogging, swimming, cycling, rope skipping, roller skating, aerobic dancing, folk dancing, stair climbing, ball games, racket games, table tennis. Choose an exercise that you enjoy. Calisthenics exercises warm you up and cool you down before and after aerobic exercise. They improve muscle strength, endurance and flexibility. Continue normal breathing as you do the exercises. To avoid injury, don't bounce or jerk when you stretch. Stop immediately if you feel pain or dizziness. Try these lighter activities like taiji, qigong, walking, bowling, table tennis, stair climbing, slow jogging, slow swimming, stretching exercises. Leg problems? 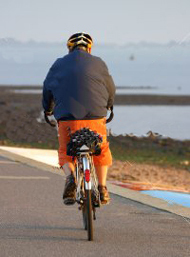 Try non-weightbearing exercises like swimming, cycling, canoeing, sailing. Tilt head down and count to 5. Return to upright position. Repeat. Turn head to the left and count to 5. Do the same for the right. Now tilt head sideways to the left and count to 5. Repeat on other side. Make slow sweeping circles with the arms. Forwards, then backwards. Feet apart. One arm overhead, reach the other arm down the leg while exhaling. Hold. Repeat on the other side. Feet apart. Stretch arms upwards. Bend down and try to touch left toes with right hand. Straighten up. Bend and try to touch right toes with your left hand. Repeat. While standing, bring one knee up to chest and hug it. Repeat on other side. Legs wide apart and hands on hips. Shift weight on right leg and bend right knee. Keeping left leg straight, bend right knee down as low as you can. Straighten and repeat on left side. These are useful for sportsmen who want to build up muscle bulk and power. They are not necessary for non-competitors and the elderly. Examples of high resistance exercises: heavy weight lifting, sprinting, isometric exercise. If you don't exercise because of a medical or physical problem, check with your doctor. You may still be able to pick up lighter activities. Go slow. Start with low intensity exercises. An excellent exercise for people of all ages, for the not-so-fit and those who want to begin exercising. Walking is especially good for those who lack time and wish to include exercise in their daily routine. It gives you the same benefits as more vigorous types of exercise. Walk as briskly as you can. Swing your arms while walking. If you have heart disease, high blood pressure, or other illness, consult your doctor first. Walking can help you back to better health. Jogging is an ideal aerobic exercise. Warm-up and cool-down calisthenics should be included. Great for heart-lung fitness and losing fat! Wear light coloured clothes or a reflecting band in the dark. Always go at a comfortable pace where you should still be able to talk or whistle. Don't jog when you're ill. Start again only when fully recovered. Stop unhealthy habits (e.g. smoking) for full benefit. Low intensity slow waltz, fox trot, slow folk. Medium intensity quick waltz, folk dance, slow disco. High intensity disco, aerobic dancing, rock and roll, ballet, jazz dancing. An excellent exercise involving almost every muscle in your body without taxing your joints. It is especially recommended for those with leg problems, chronic backache and the very overweight. To build up your fitness level you will need to swim laps. If you need to, go for a refresher or beginner's course. Don't be embarrassed to learn. Others are learning too.